The saying goes “home is where the heart is.” For one Central Florida family, that saying has multiple meanings, and rings true more than they would have ever imagined. Patrick and Melanie Doubleday serve as ambassadors for Orlando Health Arnold Palmer Hospital for Children, their local Children’s Miracle Network hospital. Their daughter, Lauren, was born at Orlando Health Winnie Palmer Hospital for Women & Babies. At birth, Lauren appeared to be perfectly healthy, but an additional round of tests detected a congenital heart defect which required immediate attention. 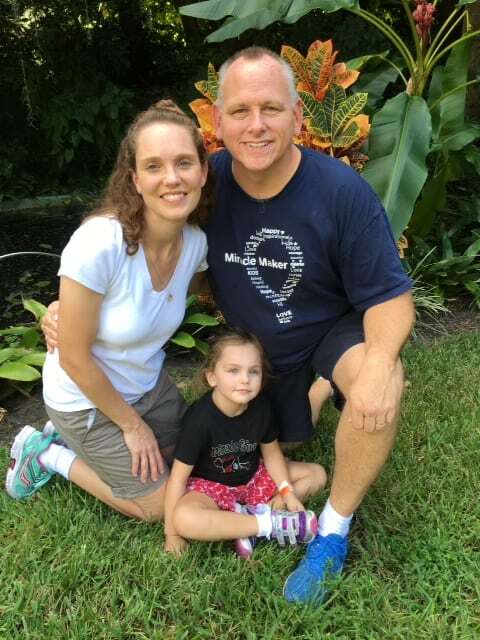 At three days old, Lauren underwent open heart surgery at Orlando Health Arnold Palmer, and her family was thankful that the hospital was able to perform the lifesaving surgery their daughter needed, allowing them to stay close to home throughout the journey. Today, Lauren is a bubbly six year old and the Doubledays are incredibly grateful to have a happy and healthy daughter. They volunteer and give back to the hospital that saved Lauren year round, and when it came time to buy a new home, they were able to give back in a way they never imagined possible: the RE/MAX Miracle Home Program. The program Miracle Home allows RE/MAX agents to market each residential listing as a Miracle Home, and make a donation to CMN Hospitals after each closed transaction. Below, Melanie shares more about what they learned through the process and how choosing a realtor committed to the community makes a difference. What made you choose RE/MAX to help purchase your home? A friend had recommended this agent that she and her husband had used previously. We met with her and felt confident she would be able to help us sell our home and purchase a new one. At the time, we didn’t know about the RE/MAX Miracle Home Program, but once we realized the connection, we could not have been more excited that we were also helping CMN Hospitals at the same time. How was your experience with the agency and your agent? Our experience was great and she helped us move through the process without any long delays and without a lot of added stress. She even continued to assist us after our new home was built to ensure every detail was completed correctly. In fact, we loved our agent so much that three of our family members have used her to sell and buy their homes. Would you recommend using an agent who participates in the Miracle Home to future prospective home-buyers? Yes, we would definitely recommend utilizing the Miracle Home program! As a home buyer or seller, there isn’t anything extra required of you – just find an agent who participates in the program, and that’s it! This was an easy way to help our local hospital make miracles happen for families like ours, and at the same time provide what we needed for our family. Have you used a RE/MAX agent to buy, sell or rent a home? This August, we celebrate RE/MAX Month of Miracles, a month-long celebration of the company’s participation as a fundraising partner of Children’s Miracle Network Hospitals. Reach out to your agent and thank them for their support of Orlando Health Arnold Palmer. Want to learn more? Call your local RE/MAX office, or identify a Miracle Agent here by entering your geographical area and choosing “Children’s Miracle Network” as their specialty. Previous post: It’s RE/MAX Month of Miracles!